You may one day run into a situation where you're asked to help with some bees and you don't have access to your bee suit. What are you going to do? Well, you can make a "bee suit" fairly easily from some things you can find around the house and, perhaps, at Home Depot or Lowes. A long sleeve shirt, long pants, and some gloves with maybe some duct tape to tape the gloves to your wrists, and to close the shirt opening at your wrist. Those are easy. But what about a veil? Bees primarily go for your head, and specifically around your eyes. A good solution that I've used is a paint strainer bag for a five gallon bucket of paint. Here's a link to a six pack at Amazon for $10, but they sell these at Home Depot, Lowes, and probably any major paint store. Here's a two-pack at Wal-Mart for $5. 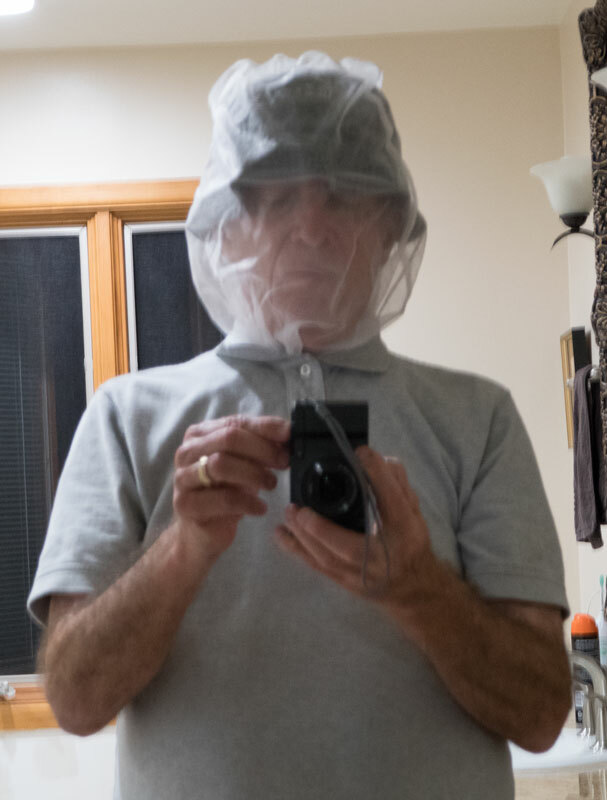 Take a hat, preferably one with a brim all around, and stick the hat into the strainer, like this: You want to keep the "veil" away from your face so the bees don't sting you through the veil. Put the seam to the side so you don't have to look through it. Put it over your head and tuck it into your shirt, buttoning the shirt all the way up. I tried to take a picture of myself in this hat and veil in a mirror. Not a great picture but you can see how it works. 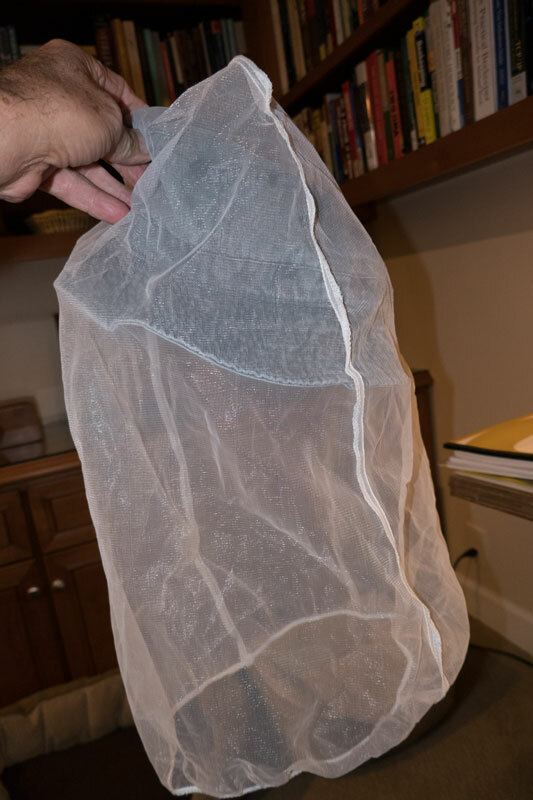 It's a bit more difficult to see through the strainer mesh than than through a regular bee veil but you can see through it and it will protect you. If you're just getting into bees and you want a very cheap bee suit, you can suit up like this. 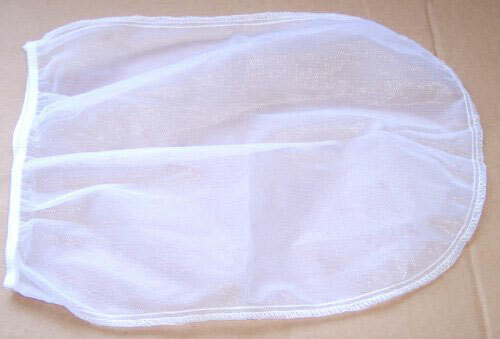 I used this particular veil to capture a swarm when I was someplace without my bee suit. I was afraid that by the time I got my bee suit, the swarm would be gone. I had to drive to Home Depot but HD was only a few minutes away from the swarm location. I was able to cut the branch the swarm was hanging on and put it into a cardboard box, which I then drove home. For those of you who might be tempted to say, "You don't need a veil when working a swarm", I'll remind you that we have Africanized bees here so before you mess with any "feral" bees, even a swarm, you want to be protected. The bees might be very docile, (these were) but if they turn out to be defensive, you want some protection.